Today’s retail trade is unthinkable without protein-enriched products. Very often the focus is on dairy products, but high-protein cereals are gaining significance too. Foods with a high protein content stand for healthy nutrition, but health benefits alone are not enough to achieve a high level of acceptance with consumers. They must offer enjoyment too. This is precisely the requirement brand suppliers and private labels in the retail trade can meet with the new range of high-protein chocolate and compound pieces from HERZA Schokolade. The range consists of protein chocolate in various shapes. In each case there is a choice between white chocolate enriched with milk protein and milk or dark chocolate with extra vegetable protein. The protein content for all chocolate and shapes is between 20 and 25 percent. The chocolate pieces are also available as low-sugar variants. Small crispies, fruit pieces or fruit powder permit an additional taste experience; they can be worked into the chocolate according to customer wishes. The shapes of HERZA’s protein chocolate pieces depend on the application and particular customer requirements. 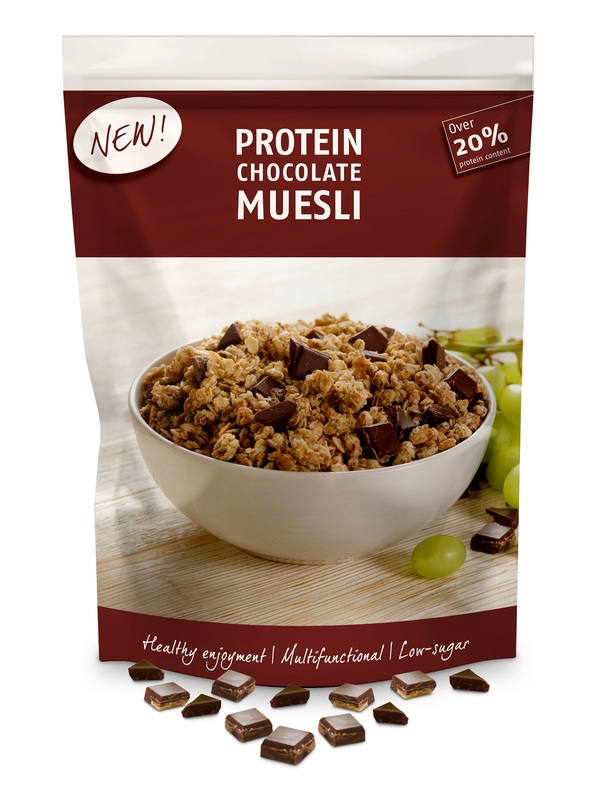 Cereal manufacturers, for example, may enrich their protein muesli with high-protein chocolate leaves to specifically address athletes and health-conscious consumers who will not want to miss their chocolate muesli. Chunks, on the other hand, can be worked into bakery products or ice cream with no trouble at all because of special formulations. Also, they are very easy to melt and to be used as a coating for bars, wafers or other protein-enriched confectionery. HERZA offers a new quark compound coating specially for ice cream varieties such as quark or skyr ice and also frozen yoghurt. These chopped pieces also contain between 20 and 25 percent protein. Integrated lime crispies give the high-protein pieces a fresh taste that also goes well with quark or skyr desserts. In a two-chamber system, these quark compound pieces can also be a delicious addition to high-protein desserts based on milk.